On this date in 1944, 24-year-old Krystyna Wituska [Polish language link] was guillotined inside the Halle-Saale Prison in Germany. She’d been convicted of espionage and treason in relation to her activities with the Polish Underground. Although for months she had feared the Germans were on to her, it wasn’t Krystyna’s own actions that lead to her arrest in October 1942. No, it was the ghost of lovers past. 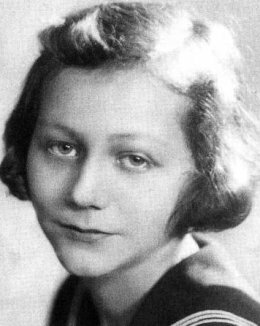 A short time before, the Nazis had picked up a former boyfriend of hers who was coincidentally also involved with the Underground. The couple had been engaged at one time, but they hadn’t seen each other since 1938 and Krystyna’s passion for him had long since cooled. It was merely a remarkably unlucky chance that the Gestapo happened to find her name in his apartment. Krystyna’s death sentence was confirmed in May 1943, but over a year passed before she was actually put to death. During the interval she kept in touch with her family and friends by mail. Her letters, punctuated with requests for items like food and warm clothing, were remarkably cheerful and upbeat in spite of her gloomy surroundings. Don’t think she was in denial about her fate, however, for she alluded to it frequently. A collection of Krystyna’s prison letters was published in Poland in 1970. In 1997 an English language edition appeared, edited by Irene Tomaszewski and titled I Am First a Human Being: The Prison Letters of Krystyna Wituska. In 2010, she was conferred the Order of Rebirth of Poland for her services to her country. I am the proud owner of an Order of Rebirth of Poland medal. My boyfriend found it in an antiques shop and bought it for me. I highly doubt it’s Krystyna’s, though.